Much research points to a positive association between exposure to fictional narratives (e.g., books, movies, TV shows) and social cognitive processes such as mental-inference ability and empathy. However, these studies have yet to be synthesized into a framework that formalizes the exact nature of how, when, and why engagement with fiction might help to promote social cognition. 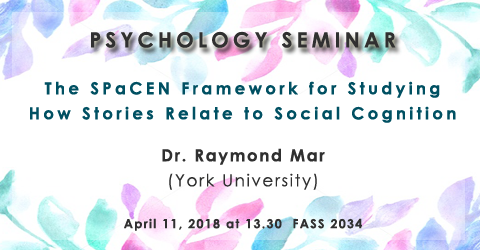 In this talk I present such a framework, entitled Social Processes and Content Entrained by Narrative (SPaCEN). It argues that there are two main routes through which stories could promote social cognition, (1) through frequent engagement of social-cognitive processes or (2) the presentation of explicit content about the social world. I outline the implications of both routes and review the supporting evidence for each. Although a great deal of research exists, there are numerous gaps in knowledge that remain unanswered and often unaddressed, providing ample motivation for future research.